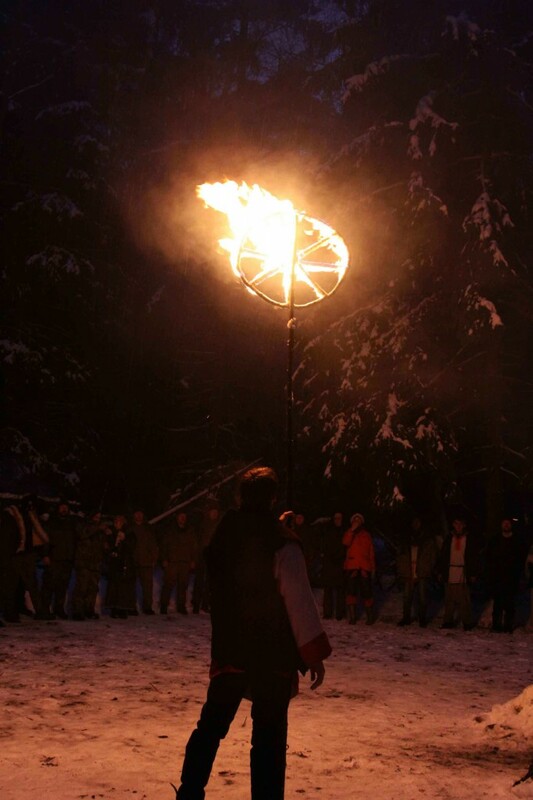 Slavic Winter Solstice Festival – Koliada! 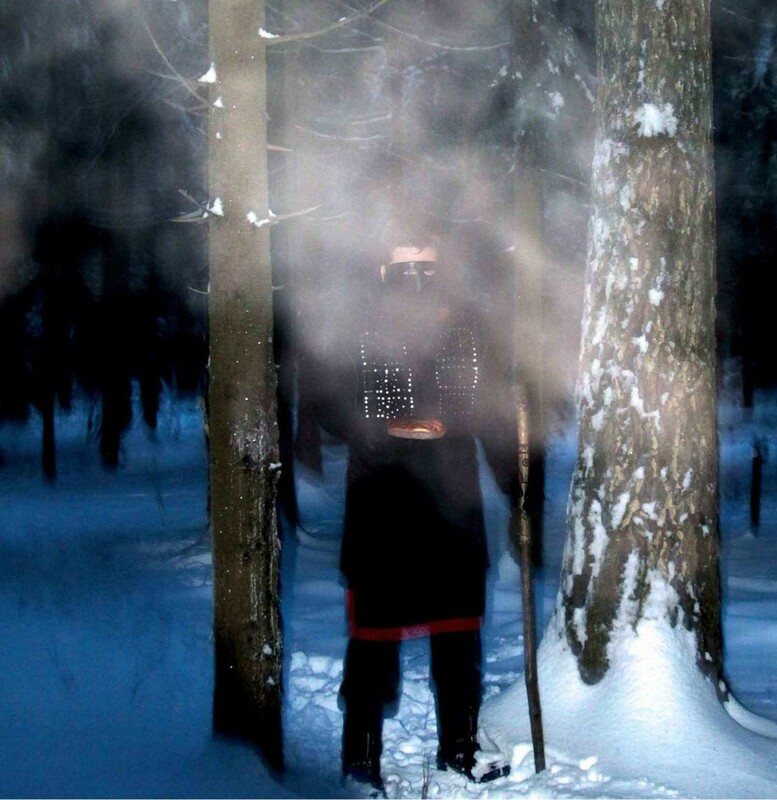 Browse: Home / 2013 / januari / Slavic Winter Solstice Festival – Koliada! It is cold and snowy outside, the days are getting shorter and shorter, and the nights are getting longer. Darkness slowly creeps into the hearts of men. On days like these few people dare to venture outside, dare to brave the dangers of these trying times. Nature itself is eagerly waiting for the final break, yearning for renewal, for the next turn of the wheel. The night reaches its final limits, testing people’s merit again and again, while drowning the brave souls in its darkness, the gloomiest darkness, after which comes the inevitable renewal. The longest night is followed by the promise of the new light, new hope, new joy. Each European nation celebrated this tricky time of the year after their own fashion. 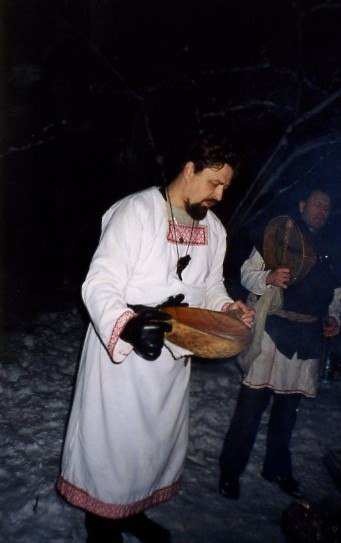 The eastern Slavic nations called this time a festival of Koliada, the Winter Solstice (‘Solntzevorot’ in Russian). 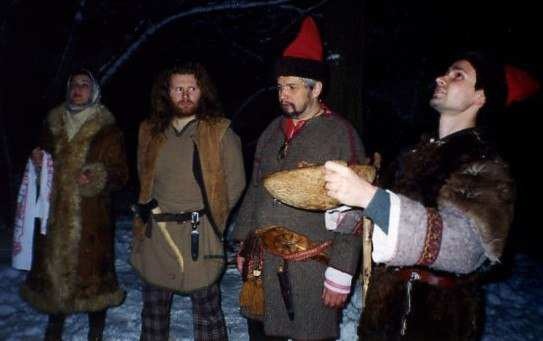 Germanic nations celebrated Yule. Even Romans had a similar holiday – the Saturnalia. In Russia this festival is also known as Korochun (or the ‘short day’ in Russian), because it is the shortest day of the year. All of these celebrations had several key elements in common, the most important one being the lighting of bonfires on the longest night of the year to help nature turn from the winter half to the summer, from darkness to light, from gloom to fun and joy. customs and traditions. Yet, despite this struggle, the common folk carefully preserved the key Koliada rites, and faithfully enacted them every year on the longest and toughest night of them all. As of old, the people helped nature cross that ominous boundary between darkness and light. Although, they’ve become Christians, our grandparents still kept the light of the ancient pagan tradition alive in their heart of hearts. folk seasonal rites, including the koliada celebrations. from door to door, singing ritual songs, asking for sweets at Koliada) to me was always associated with the earliest childhood memories – of wearing animal masks, dressing up in funny costumes and collecting sweets from adults into my bag. 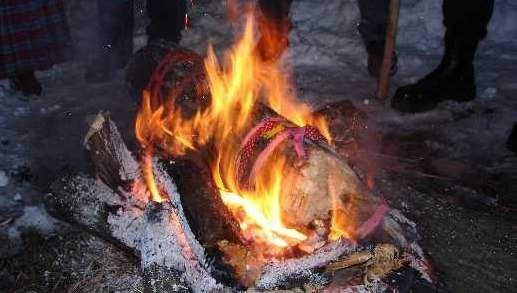 Koliada for us was the time between Korochun (the Winter Solstice) and the first of January. At this time we usually burned lots of candles and sparklers, to light up this darkest time of the year. Sparks from the sparklers, I think, were supposed to echo the ancient custom of banging the sparks from the burning Budnik (the ritual log, that is lit up at Koliada, much like the English Yule log). lanterns, singing special koliada songs – koliadki – and collecting sweets. preserved than in the Russian Federation. There will be an abundance of grain. 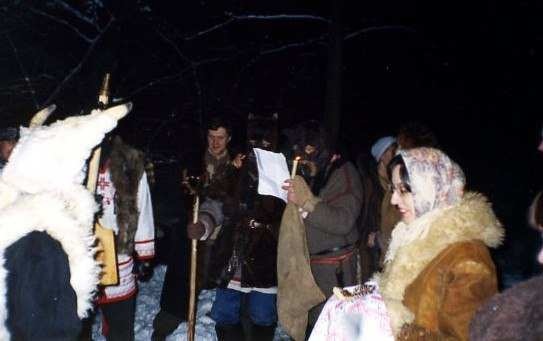 endured best – in villages it is still customary to perform koliadovanie every year (masked carolers go from door to door asking for gifts), mysteries with masked processions, the divinations, the perception of this holiday as being the time, when the extramundane world mixes with our own world of mortals most intimately. cross the veil into the otherworld, while their children move away to the big cities and don’t pass on the old ways to their progeny. 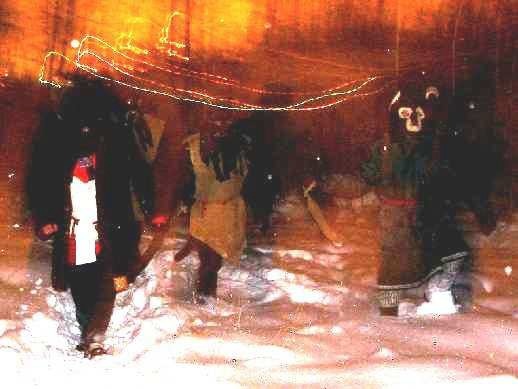 Nevertheless, the fact that the Koliada customs are still around, with their obvious pagan elements, points to the absolute importance of the Winter Solstice to the minds and hearts of our ancestors. 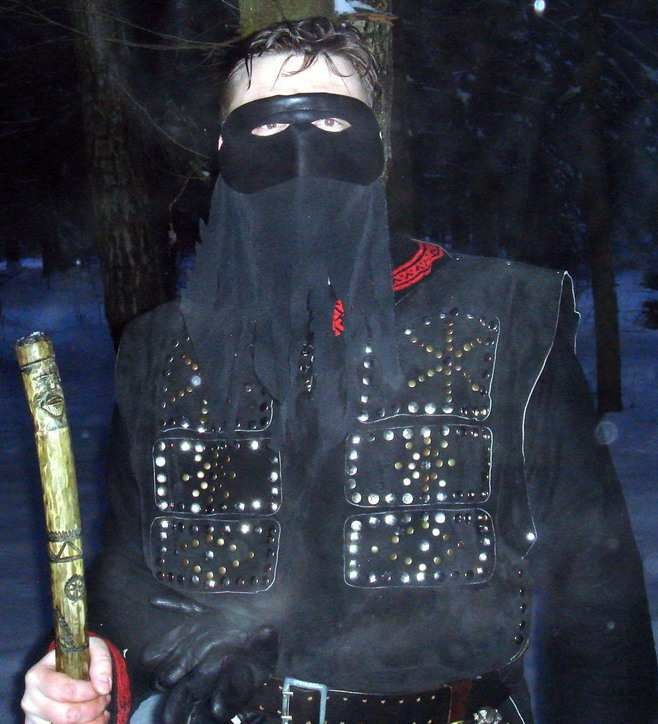 Christianity remains the religion of the majority for eastern Slavs, and has been so for a thousand years. All this time the Church took great efforts in trying to eradicate folk pagan beliefs and practices, or, if all else failed, to hijack the rituals and attach them to some Christian holiday or saint day. Many of the old customs and rituals got lost in the ages, but the folk customs at Korochun or Koliada, were kept in the folk conscious memory throughout all these years. cultural phenomenon in the early 1990’s. 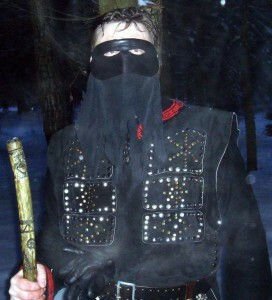 television program in May of 2012, featuring Veledor, the co-chairman of the Circle of Pagan Traditions, mentioned an estimated figure of 15 thousand pagans in Moscow alone! festival. Koliada is the very day of change. It is an act of creation. afterwards, is its subject and depends on it, and is governed by it…”. Ermakov and Gavrilov also discuss the nature of Koliada as a point of ‘nontime’, at the very edge of the fabric of the universe, when the veil between the worlds is thin, and the spirits of our ancestors visit the world of the living. The masks and costumes are intended to represent precisely these spirits of our ancestors, who passed over the veil from the world of the living to the world of the dead. the world of mortal matter (Yav’ – the manifested or middle world), which is to say, the ‘Others’ become ‘embodied’. The ‘Others’, then come out of the Darkness and begin to play tricks on mortals, for example, attempt to pull apart the ritual fire stack and thus extinguish the Light. messenger of this God, or his priest. This special guest tests the participants with tricky questions, gives advice and divines the future. 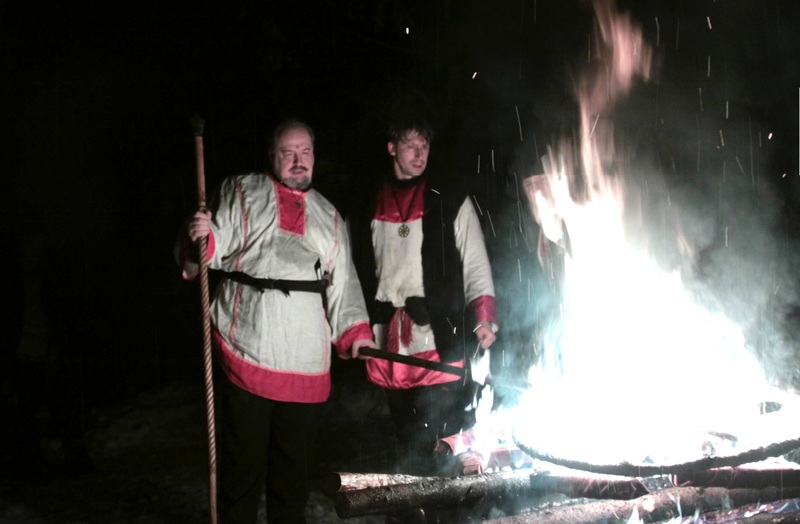 Polaznik bangs his staff on a special log in the Koliada bonfire, called the Budnik (it is similar to the English Yule log), until the sparks fly off into the darkness. If these sparks are nice and long, then the fire is known as a merry fire. Such a fire promises abundance and the quick retreat of Darkness. growing power of the sun, and the daylight grows from this moment on. world of mortals (yav’), it is also the time when one can glimpse the hidden knowledge and change one’s destiny. These elements determine the main points of the ritual actions. them from manifesting that night. Also, it is the invocation and the arrival of Polaznik (the original prototype of Grandfather Frost), as a manifestation of Veles (the god of the otherworld, of wild nature, hidden knowledge and wealth). He is honored and placated in order to receive, in turn, his blessings. 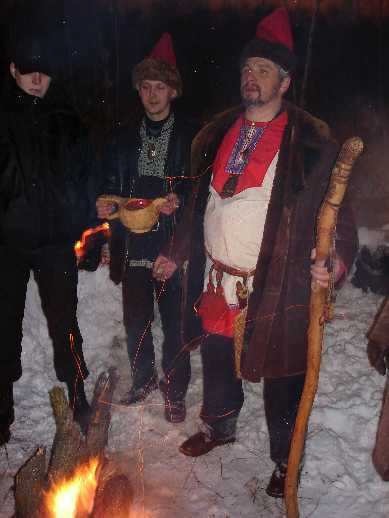 And it is also the sending Budnik (ritually chosen and cut log) forth in sparks, as a messenger through the medium of fire to the Gods with personal wishes. And it is also the various divinations. The number of sparks and the collected gifts tell us about the future harvest and prosperity. The melted wax tells us about the near future. And the young girls are trying to divine, what their intended husband will be like, etc. both in the world outside and within each person’s very soul. 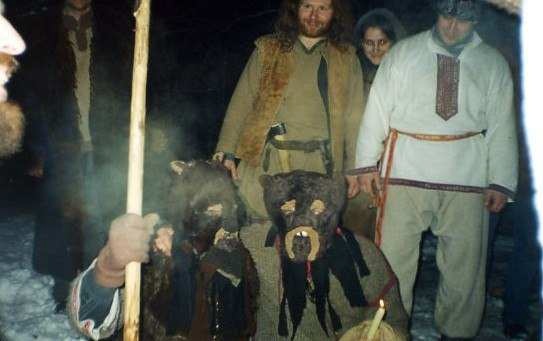 Veledor, Yggeld and many other followers of the Slavic pagan tradition will gather in a Moscow park on this day. They will light the koliada ritual bonfire, put on the old masks and sing traditional songs, making sparks fly, so that the ancient mysteries shine again, fill our souls with their eternal wisdom and grant us all strength for this new turn of the wheel of the year!